By the day of Galungan, the Balinese who work in the city of Denpasar, they returned home to her parents in the village. When they gathered together Galungan brothers who migrate to other regions. After the holidays were over, Balinese back to the city to work as usual. 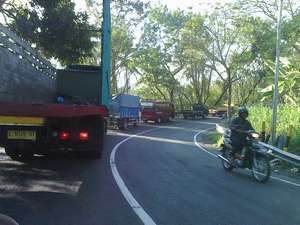 Especially the most visible is on the Denpasar-Gilimanuk highway. Simultaneously they returned to the city, and crowded highways. So the Denpasar-Gilimanuk highway very solid with vehicles.